Stomach, Forestomach - Mineralization in a male B6C3F1 mouse from a chronic study. 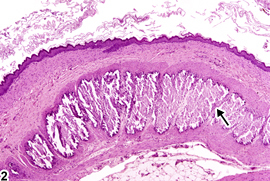 Mineralization (arrow) is present along the basement membrane of the forestomach. Stomach, Forestomach - Mineralization in a male F344/N rat from a chronic study. 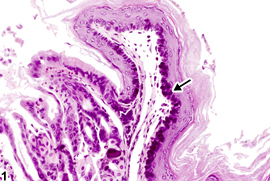 Mineralization (arrow) of tunica muscularis of forestomach is present.